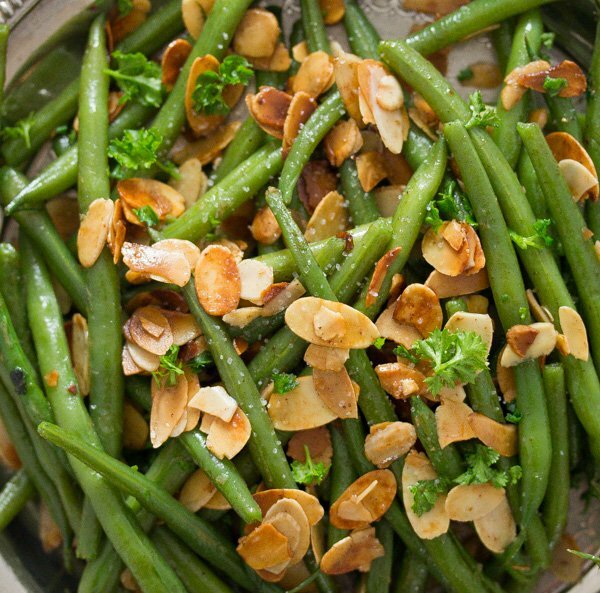 An easy to make green beans almondine recipe, French style sauteed green beans with almonds. Green beans. Not my vegetable of choice as a child, green beans stew and green beans soup were the worst my grandma ever cooked during those days. I would have rather eaten pig feet in aspic (which is a real Romania dish called piftie or racitura) than anything with green beans. The only green beans dish I used to like as a child was a green beans in garlic sauce dish. To think about it, that was probably due to the fact that there was so much garlic involved, it kind of managed to annihilate the green bean taste. Things changed, I love green beans nowadays and funnily enough my favorite green bean dish is the above mentioned green beans stew, which only contains green beans and tomatoes… Absolutely delicious with mashed potatoes, I can’t believe there was a time I used to hate it. And there are so many other wonderful ways with green beans, this green beans almondine recipe for instance. 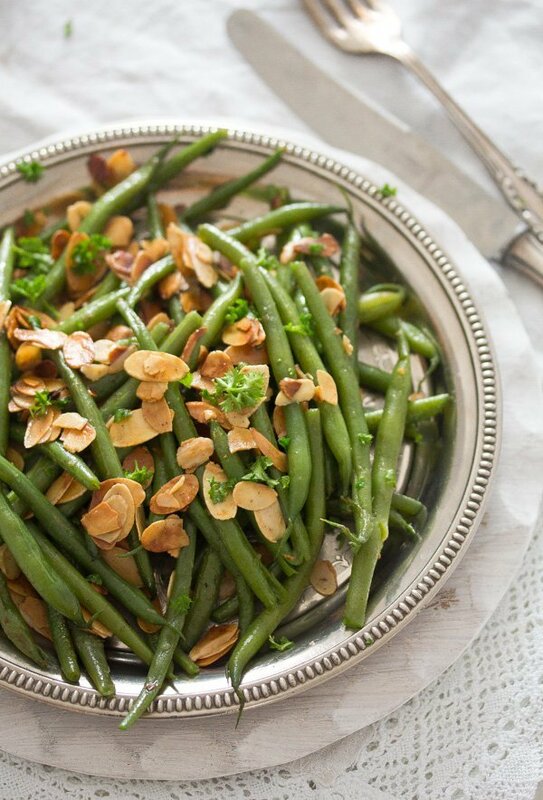 The green beans almondine is known under many different names: green beans almondine, green beans amandine, French style green beans, sauteed French green beans, green beans with almonds and so on. 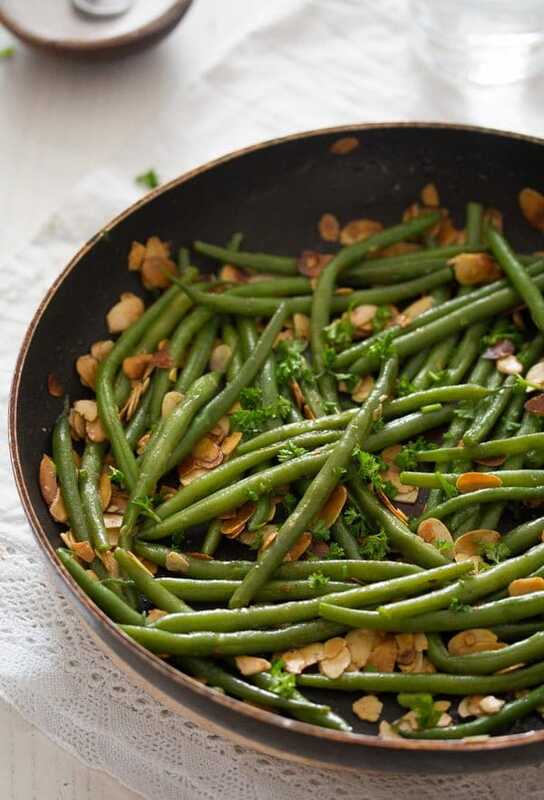 While researching for this sauteed green beans with almonds I was kind of surprised to find out that this should be an original French recipe called haricots verts amandine. You see, I have been sauteing green beans with almonds for years and I have always assumed this recipe to be a typical German way of cooking green beans. It seems that I was wrong. 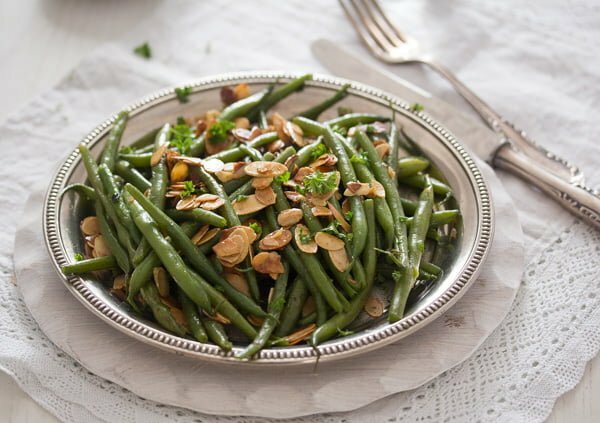 What are green beans almondine or amandine? 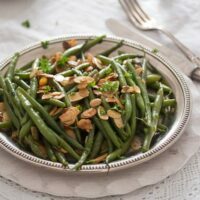 Green beans almondine is a simple French side dish of sauteed green beans with a garnish of almonds, amandine being the culinary word for garnish with almonds. 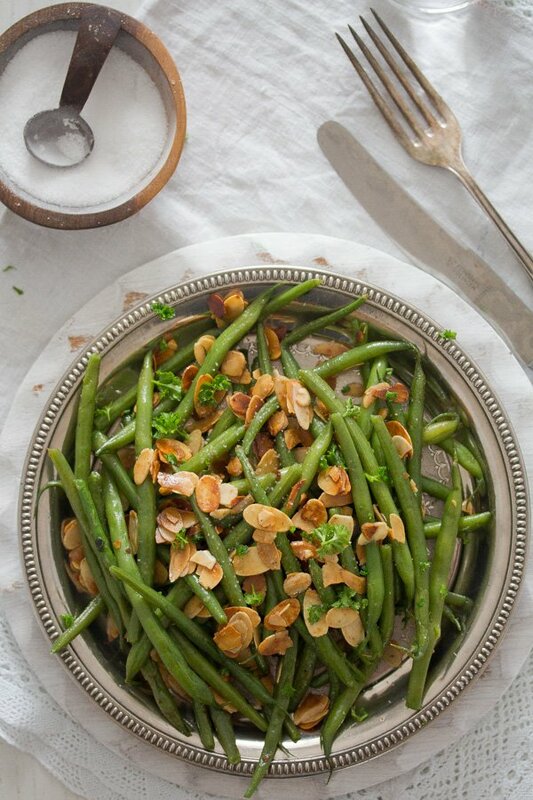 Not only green beans can be “cooked” amandine, but also fish, asparagus or potatoes. According to Wikipedia, almondine (which is a bit different to amandine) is just the term used in American cookbooks. Trimming green beans is not difficult but it can take its time unless you have a method. Just picking the green beans one by one and cutting each end individually makes things tiresome. The best and quickest way of trimming green beans is to take one handful of green beans, line them up on a cutting board and cut off the ends in one slice. I only remove the knobby ends of the green beans, the ones where the green beans are attached to the plant. I leave the other ends on, they are tender and actually rather pretty as they are. When it comes to trimming green beans, the German supermarkets make it easy for me. Green beans are sold in 250 g/ 8.8 oz packages and the beans are all very neatly packed, all knobby end lined up and facing one direction. All I have to do is to carefully take the beans out of the package, usually in two or three batches, and slice off the knobby ends. If that is not the case with the green beans you buy, you will have to take the time to arrange them all properly. 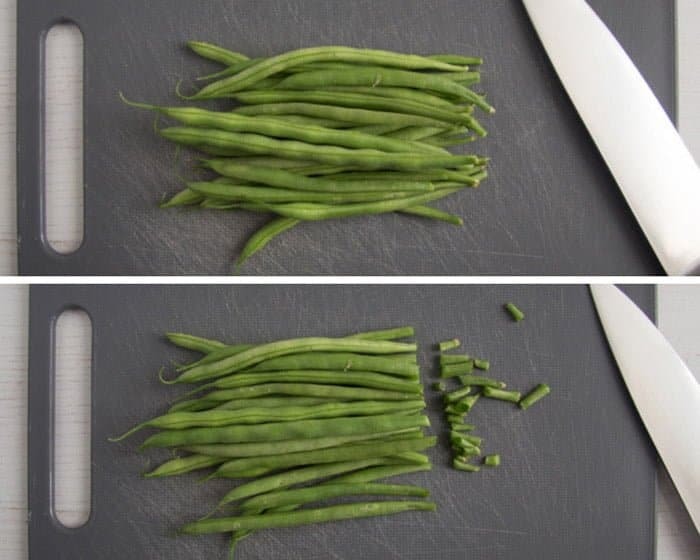 To make things easier in this case, just line the green beans up and slice off both ends, this way you are sure to remove all the tough ends without spending time with arranging the beans. Step 1: Wash and trim the green beans as instructed above. If the green beans are too long, cut them in half. Step 2: Give the green beans to a large pot of boiling and very salted water, add 1 teaspoon butter. Cook the green beans until tender but still crisp, about 6 – 7 minutes or to your liking. Some like them very crispy, some softer. Just don’t cook them mushy, you won’t like them. Drain. Step 3: Ice bath. Some do it, some don’t! If immediately plunged into ice water the green beans will retain a vibrant green color and the cooking process will be stopped immediately, meaning that the green beans will remain crisp. Step 4: Drain the beans again and pat dry with kitchen paper. If there is too much water clinging to the green beans, the end dish will be rather watery. Step 4: Melt 3 tablespoons butter in a large pan. 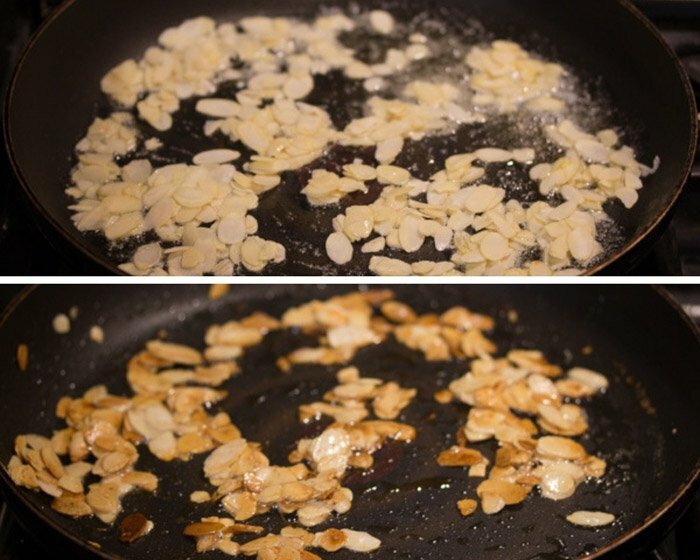 Add the slivered almonds and cook on medium heat, stirring often, until golden brown, about 3 minutes. Step 5: Add the green beans to the pan. Add half of the lemon juice and some salt and pepper as well. Stir well or shake the pan to make sure that the beans are coated in butter and that the almonds and green beans have mingled. Step 6: Add more of the remaining lemon juice and some salt and pepper to taste. The green beans almondine are best served immediately. However, they can be reheated, stirring often until the beans are heated through and glossy again. If you want to make the sauteed green beans with almonds dish ahead, the best way is to cook the green beans in advance (up to two days) and keep them refrigerated. Bring to room temperature before adding to the almond sauce. Make the almondine and reheat the green beans in the pan with the almond sauce, they might need an extra minute. Check and don’t let the green beans cook again for too long, they should remain crispy tender. Wash and trim the green beans. Line up a handful of beans and cut off the tips in one slice. Only remove the tougher ends, those that were attached to the stem. You don't have to remove the top side with the tender shoots. Halve the beans if very long. Bring a pot of water to a boil. Add salt generously and 1 teaspoon butter. Cook the green beans until tender but still crisp, about 6 - 7 minutes or to your liking. While the green beans are cooking, fill a large bowl with water and add ice cubes and set it aside. Drain the beans in a colander and plunge them into the ice water immediately. This way they will retain their bright green color and remain crisp. Drain the green beans again and pat dry with kitchen paper. Melt 3 tablespoons butter in a large pan. Add almonds and cook on medium heat, stirring often, until golden brown, about 3 minutes. Add the green beans, half of the lemon juice, salt and freshly ground black pepper. Stir well to coat the green beans with the butter. Reheat for about 1 minute, they should become glossy. Add more lemon juice, salt and pepper to taste. Sprinkle some chopped parsley on top. Looks so delicious with golden buttery slivered almonds! 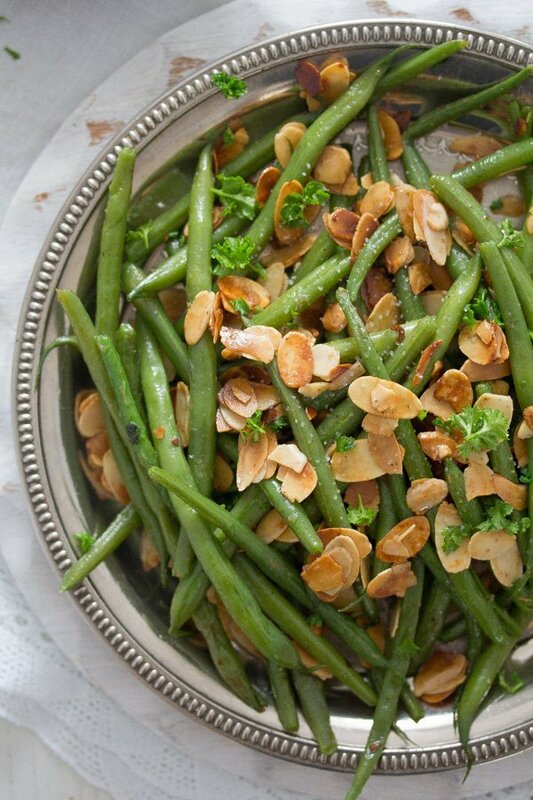 Adina, I love green beans and this is such a beautiful and delicious way to serve them!